During 2014-17, Saudi Arabia economy witnessed a setback owing to decline in oil prices, consequently, leading to delay in construction projects across the country. Industrial valves market in Saudi Arabia registered a weak demand amidst the crisis which resulted in decline in market. However, the market is further expected to bounce back over the coming years owing to recovery of oil prices, economic stability and growth of non-oil sector. Additionally, growing construction projects would further proliferate the market demand. Water and wastewater application registered the highest Saudi Arabia industrial valves market share as compared to other applications, to regulate the water flow round the clock. Being a basic component while designing of infrastructure, industrial valves are used on a large scale for regulating various functions in water and wastewater applications. The Saudi Arabia industrial valves market report comprehensively covers the industrial valves market by types, applications and regions. 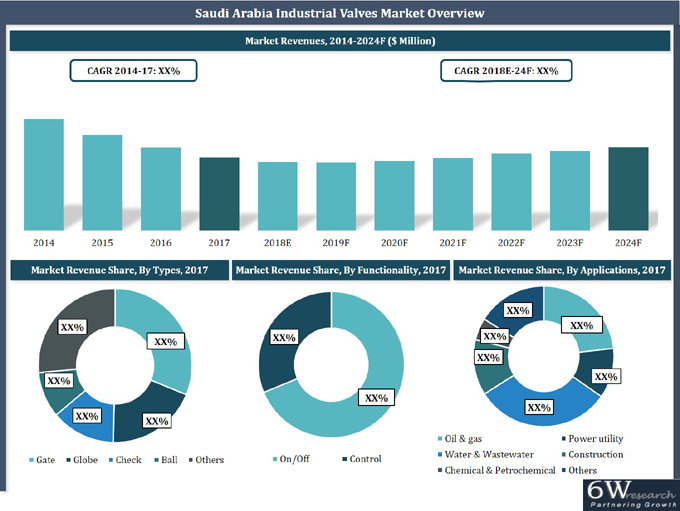 The Saudi Arabia industrial valves market outlook report provides an unbiased and detailed analysis of the Saudi Arabia industrial valves market trends, opportunities/high growth areas and market drivers which would help the stakeholders to device and align their market strategies according to the current and future market dynamics. 12.1 Pan Gulf Valves Manufacturing Co. Ltd.